Free Shipping Included! 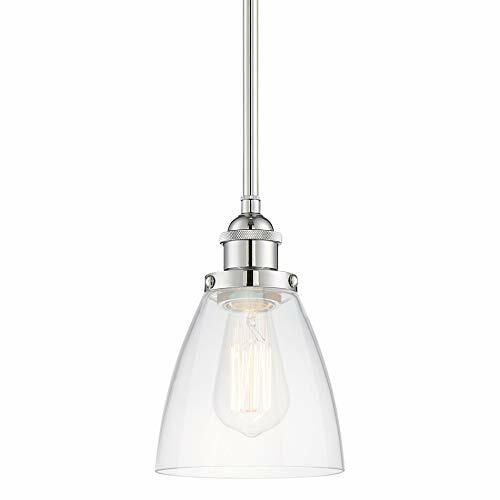 Kira Home Porter 8'' Stem-Hung Industrial Pendant Light + Mini Glass Shade, Chrome Finish by Kira Home at Elect Forum. MPN: RV-CP6962-CH. Hurry! Limited time offer. Offer valid only while supplies last. The Porter Pendant light exhibits a very classic and minimalist design with an industrial feel; making it an ideal choice for a variety of locations. The Porter Pendant light exhibits a very classic and minimalist design with an industrial feel; making it an ideal choice for a variety of locations. With it's verstile look you decide how you want to design your look whether you want to shorten your hanging length to become a semi-flush light or purchase multiple units to install over a kitchen island the possibilities are endless. The best part is you don't have you break your wallet to design a truly unique look that you're sure to get compliments on. If you want to achieve the ultimate industrial look pair your pendant light with our Vintage Edison Bulbs (Item#B01M04MSD6). DIMENSIONS: Pendant Dimensions: 8.25" (H) x 5.75" (D). Canopy Dimensions: 4.75" (D) x 0.75" (H). Shade Dimensions: 5.75" (D) x 5.5" (H). Includes (3) 12" downrods and (1) 6" downrod. Minimum hanging height of 17" and maximum hanging height of 53"